Never tolerate mouse or rat infestation in your Cape Cod home or business. At Pest Pros, we have the team, tools, knowledge and experience to serve as your best mouse exterminator in Wareham, MA and throughout the area. We provide fast and dependable service — and can help exterminate mice and rats from your home quickly and we clean up any bacteria they may have left behind from a rat or mouse infestation. When you’re in need of rat or mouse control in Cape Cod, make sure the job is done quickly and done right when you call on Pest Pros. At Pest Pros, we know how bothersome a mouse or rate infestation can be. Mice and rats can affect your home or business in different ways. 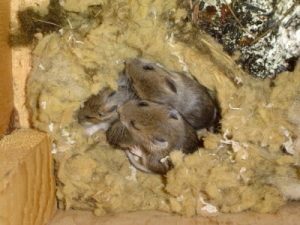 Mice nest within structures in tight areas and commonly prefer to use fiberglass insulation as a nesting material and establish “territory” near food sources that are generally 10-30 feet from their nest. They become prolific breeders by two months of age, and have litters as often as every 40-50 days, with four to seven young per litter. Mice spread quickly throughout your home or business leaving bacteria and droppings in your insulation. Rats are bigger than mice and are known to easily spread disease to humans. They also live longer than mice meaning that they could stick around for up to five years. Both rats and mice wreak havoc in your home and can spread harmful bacteria throughout your living space. If you notice rat or mice droppings in your home, contact us right away! We serve communities all over Cape Code, including Duxbury, Plymouth, Falmouth, Yarmouth, Hyannis, Chatham, Barnstable, Wareham, Dennis, Orleans, Scituate, Kingston, Marshfield, Sandwich and others. If you live or work in the Cape Cod area contact the best rat and mouse exterminator, call the trusted team at Pest Pros!